Science, journalism, communication and tradition all took a wild ride around the stage Friday night on Krauss and DiChristina’s shoulders in the last — and best — of this season’s Origins Project dialogues. Arizona State University’s Origins Project dialogues are a series of freewheeling conversations between Krauss and a variety of thinkers on humankind’s fundamental questions — where did we come from, why are we here — and sometimes just funny stories. Krauss, a theoretical physicist and cosmologist, Foundation Professor of the School of Earth and Space Exploration, director of the Origins Project, and the only physicist to have received awards from all three major American physics societies, sat down with DiChristina, editor-in-chief and senior vice president of Scientific American, the longest continuously published magazine in the U.S., former president of the National Association of Science Writers, and honoree as a corporate visionary by the Folio Top Women in Media Awards. 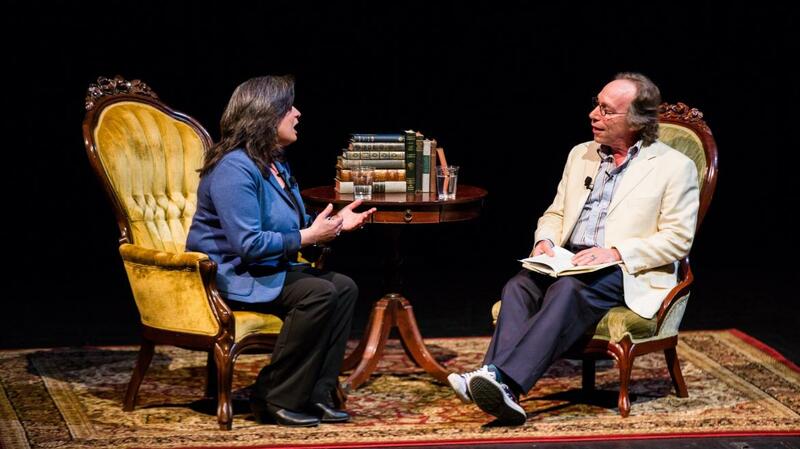 Krauss called DiChristina a “rock star of science journalism” Friday at the Herberger Theater Center in downtown Phoenix. “She oversees reaching more people about science than anyone else in the world,” he said. Krauss has written seven articles for Scientific American and sits on the advisory board. DiChristina has been editor-in-chief for six years. The magazine boasts 3.5 million readers, with 7 million online views monthly. Fifteen percent of Nobel laureates have written for Scientific American. About 139,000 American scientists subscribe to the magazine. When Thomas Edison invented the phonograph, he brought it to the offices of Scientific American first. DiChristina is the first female editor in 170 years. “Is that significant?” Krauss asked. “I happened to be in the right place at the right time with the right skills,” DiChristina said. She said being a woman has no effect on content. “We all enjoy science, right?” she said. DiChristina goes to conferences and keeps her ear to the ground to keep abreast of trends. “Any leader of an editorial team has to do that,” she said. How does she choose stories? “I wish there was an exact science to choosing science features,” she said. “The first thing I think of is: Who am I talking to? … I feel like we’re setting a feast for our audience. … I hope we are surprising and delighting the audience. “Why do we still have magazines?’ Krauss asked. “Because they’re tactile,” DiChristina said, discussing the beautiful paper and printing that escapes online content. “They’re enjoyable. … They’re like anything else — people like them. The School of Earth and Space Exploration is part of the College of Liberal Arts and Sciences.